1 to 2 tsps. 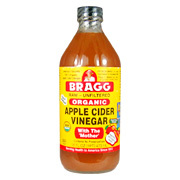 Bragg Organic Vinegar in 8 oz. Glass Purified Water and (optional) 1 to 2 tsps. Organic Honey, 100 % Maple Syrup, Blackstrap Molasses or 4 drops herb Stevia. other ingredients: Certified Organic Raw Apple Cider Vinegar is unfiltered, unheated, unpasturized and is diluted with purified water to 5 % acidity. Unfiltered Apple Cider Vinegar Organic Raw is shipped in a discrete, unmarked package. Orders are processed immediately and usually take about 3 to 5 working days to be received. We do ask that you try it for 2 to 3 weeks to feel the full effects. Any information received is used only for order processing and shipping purposes. Your information, such as e-mail address, will never be disclosed to a third party.